While we were waiting for Donald Trump to become President, there were some things going on in Washington that we need to look at. At the time these things may not have seemed important, but in view of recent events, they need to be re-examined. Yesterday PJ Media reported on a New York Times story from January 12, 2017,. This is essentially a land mine placed in the path of the Trump Administration by the Obama Administration. If I told you how angry I was about this, this blog would no longer be family-friendly. I hope Americans can put partisan politics aside and realize how damaging this is to the country and to the Fourth Amendment rights of all Americans. Former President Obama has gone out of his way to make things difficult for President Trump. This is not appropriate. It is petty, vindictive and unpatriotic. If laws were not broken, there cannot be a legal penalty, but there should be a public censure of some sort. I have always felt that former President Obama did not understand America. His actions in the last months of his presidency and his actions since leaving office have convinced me that is true. There was much discussion about the Second Amendment during the presidency of Barack Obama. President Obama was the most successful gun salesman of all time. That became obvious at local gun shows when sales dropped precipitously after November. However, President Obama left a legacy in the courts that may not protect the rights of gun owners. A website called cheaperthandirt posted a story on January 29th about a decision in the U.S. Court of Appeals for the Fourth Circuit. The case, United States v. Robinson, has been a roller coaster of conflicting opinions ever since Mr. Robinson first moved to have the evidence in the case against him suppressed for violation of his Fourth Amendment right against unreasonable search and seizure. The issue presented by the case is whether police officers, having reason to believe a person is in possession of a firearm, can legally treat the individual as dangerous, even if they have no reason to believe the possession is illegal and even if the person’s behavior is not overtly threatening. Both officers testified that Robinson was cooperative throughout the encounter and that they never observed any gestures indicating he intended to use any weapons against them. After the frisk, one of the officers realized that he recognized Robinson from prior criminal proceedings. Confirming that Robinson had a felony record, the officer arrested him for felon in possession of a firearm. The case was then tried in federal court. Under Supreme Court precedent from 1968 (Terry v. Ohio), police officers who believe a suspect they have detained for investigation but have not arrested can conduct a limited “pat down” of the suspect’s outer clothing when they have reasonable suspicion that the suspect is “armed and dangerous.” This was the basis for the search the officers used to find the incriminating firearm in Robinson’s pocket. But Robinson claimed that the officers had no reason to believe that he posed any danger to them and therefore that they had no legal authority to frisk him. He noted that people may lawfully carry firearms in West Virginia, that the police had no information at the time of the frisk that his carrying was unlawful, and that he did not act aggressively or uncooperatively toward the officers. The article goes on to explain that when the case was originally heard by a magistrate judge, the judge agreed with Mr. Robinson and asked that the evidence of the firearm be disallowed. The district court judge rejected the recommendation. Mr. Robinson then appealed to the U.S. Court of Appeals for the Fourth Circuit. [I]n states like West Virginia, which broadly allow public possession of firearms, reasonable suspicion that a person is armed does not by itself give rise to reasonable suspicion that the person is dangerous for Terry purposes. Where the state legislature has decided that its citizens may be entrusted to carry firearms on public streets, we may not make the contrary assumption that those firearms inherently pose a danger justifying their seizure by law enforcement officers without consent. … Nor will we adopt a rule that would effectively eliminate Fourth Amendment protections for lawfully armed persons … authorizing a personally intrusive frisk whenever a citizen stopped by the police is exercising the constitutional right to bear arms. [Quotation marks and citations omitted]. President Obama’s Justice Department then asked the entire Fourth Circuit Court of Appeals to rehear the decision. The decision was then reversed. The court also asserted the same “logic” applies, even if possession of the weapon is legal. “The presumptive lawfulness of an individual’s gun possession in a particular State does next to nothing to negate the reasonable concern an officer has for his own safety when forcing an encounter with an individual who is armed with a gun and whose propensities are unknown,” the majority opinion concludes. Incredibly, though the court resolved the case on the broadest constitutional proposition possible, the majority opinion then went on to describe all the circumstances known to the officers that would have allowed them to make an individual “dangerousness” determination under the facts of the case. Thus, the majority essentially admitted that the patently anti-gun holding of the case–that all persons armed with a gun are a per se lethal threat to police officers–wasn’t even necessary to its resolution. Judge Wynn went on to explain how he believes the law of the Fourth Circuit—which includes Maryland, North Carolina, South Carolina, Virginia, and West Virginia—is now that lawful gun owners are second class citizens. Mr. Robinson’s Fourth Amendment right against unreasonable search and seizure was violated. I understand the feeling the police may have had that they wanted to prevent a crime, but the frisking of a passenger in a car that was stopped because people were not wearing seat belts is over the top. A man carrying a gun in West Virginia is not all that unusual. I hope Mr. Robinson takes his case to the Supreme Court. A person with a gun does not automatically need to give up his Fourth Amendment rights. Admittedly, the case is muddied by the fact that Mr. Robinson should not have had the gun, but that is a separate issue. The police had no reason to frisk a passenger in a car just because the passengers were not wearing seat belts. 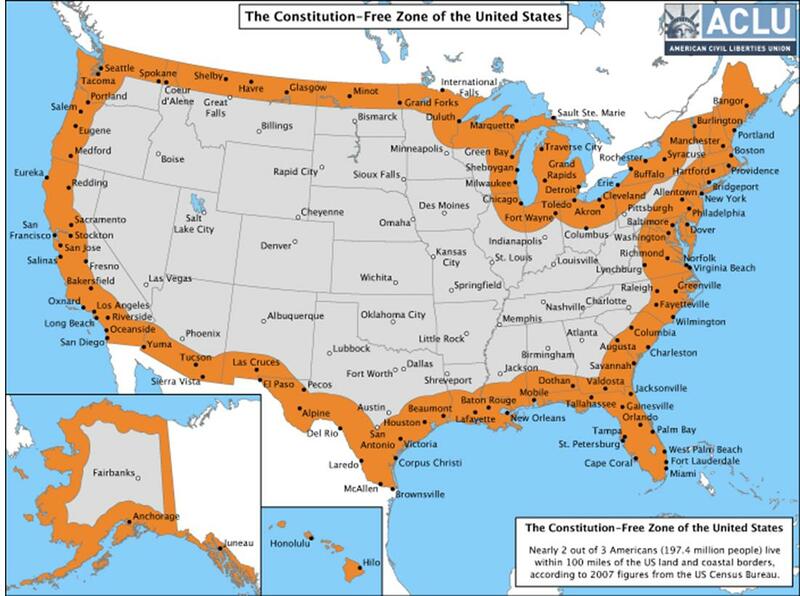 The map describes the shaded area as the Constitution-Free Zone in the United States. So what is this about? Notice that the date on this is 2008. As far as I know, the Obama Administration has continued the policies of the Bush Administration in this area and added other forms of surveillance as well. Where is the update on this concern? The Boston Globe is reporting today that Boston will ban smoking in public housing, beginning in September 2012. The policy is aimed at protecting nonsmokers, especially children, from breathing in secondhand cigarette smoke from neighboring units, which can cause asthma attacks, respiratory infections, lung cancer, and heart disease. Meanwhile, back at the ranch… WTSP Channel 10 in Tampa Bay, Florida, reports that the Florida law requiring welfare recipients to pass a drug test is a violation of the 4th Amendment. …As we 10News reported Wednesday, attorneys from the ACLU are already working on a lawsuit to challenge the constitutionality of these drug tests. First of all, I would like to state that as someone who has never smoked or used illegal drugs, I don’t have a horse in this race. I do, however, possess a rather ironic sense of humor, and I think looking at these two stories together is very interesting. Which is more harmful to a child–a parent who smokes or a parent who uses illegal drugs? Before you answer than, consider the people the parent comes in contact with in obtaining illegal drugs. Smoking is legal; illegal drugs are illegal. Why is the ACLU fighting the drug test and not the smoking ban? This seems a little odd to me.